I’m currently finishing my final semester of my senior year of high school. The school I attend, Cairine Wilson Secondary, has been making steps towards becoming a more globally aware institution. As a student of the International Certificate Program and of Korean Culture, it wasn’t a surprise when I was approached with the task of preparing a workshop on introducing Korea to my peers. I was thrilled at the opportunity to share what I knew with my community. I started with gathering basic information on the aspects of Korean culture that I hear people talk most about, food and media. My mouth started to water as I glanced through photos of Japchae and Bulgogi, pondering which picture would best capture the flavours of Korea. I had to hold myself back from dedicating entire slides to my favourite K-pop groups and from filling the presentation with clips that split my side with laughter when I watched them at home. I needed to be educational, at least that’s what I kept telling myself as I watched Running Man on repeat. Everyone who came to the workshop on Diversity Day received Chapsal Yakgwa, a traditional confectionary, to try. All of the people who tried the snack found it tasty and right away became receptive to what I was saying, a great way to start the workshop. I began with introducing myself and the K.C.C. (Korean Cultural Centre) to the group. “I am no expert on Korea, but if you have any questions throughout the presentation, don’t hesitate to ask”. I started with the basics, Korea’s population and it’s national currency. Little facts about the country that gave some ideas as to the identity of the nation. Two of the main topics I covered were Korea’s traditional and pop culture. For the traditional aspect, I went into some depth about traditional dress, calligraphy, and housing. I also introduced the group to the Korean language; covering a few basic phrases and how letters from the alphabet were built together to create words. It was nice to hear people trying to learn how to say things like “Hello” and “Thank you” in a language that I’ve long been trying to become familiar with myself. 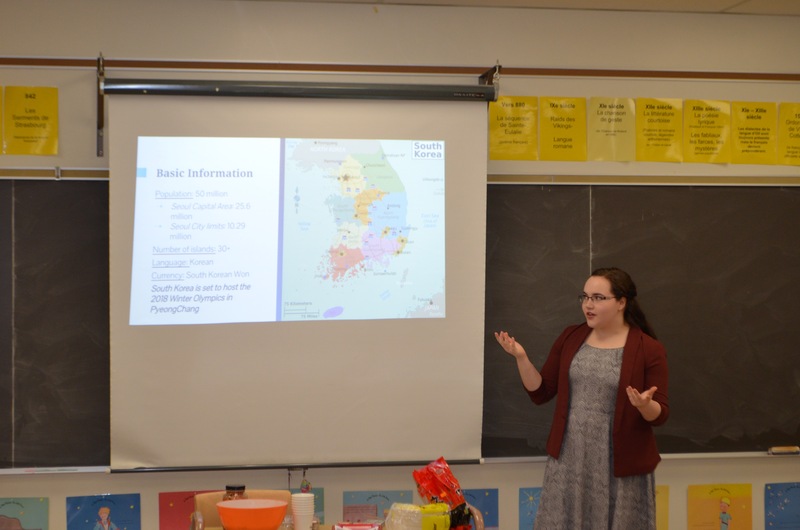 I managed to take up half of my presentation talking about Korean food. Covering everything from side dishes to street fare, I’m positive my mouth wasn’t the only one beginning to water. Students would react to food they’d seen before, asking what I had thought when I had tried them. Of course, I included photos of food I’d eaten in Ottawa, I wanted them to see what kinds of Korean food Ottawa had so they could try it for themselves. I had bought fresh Kimchi from Raon Kitchen downtown, which was given to any students who wished to try the popular side dish. It was a lot of fun to watch these students animatedly chat about things they were discovering about Korea and its culture. I wanted to make sure that the workshop was interactive, so I prepared Shin Ramyeon for a contest. Two students would eat a cup full of the noodles, whoever finished the cup first would receive a prize. ¨Is this something that Korean students do for fun?” ¨I don’t know about that, I just wanted to see how you guys would handle the spice!” I also included a quiz at the end of the workshop, the winner receiving a prize in the form of a little sweet. Overall I had a great experience, it was nice to share what I was passionate about with people in my community. It also gave me room to grow and experience what it was like to be a teacher, one of the career’s I am considering to study for in University. It is my hope that this is the first of many workshops that I get to lead in my life. I can only hope that the topics are as interesting as Korea is to me today. KOREAlity or Fiction #2: Did they exist or not?